Beautiful rare wild snow leopard seen by KarmaQuest / Snow Leopard Conservancy trek participants in northern India during a previous winter trek. Photo by Brian Keating. there’s still a bit of time to sign up for the Snow Leopard Conservancy and KarmaQuest trek in search of wild snow leopards in the Himalayas. 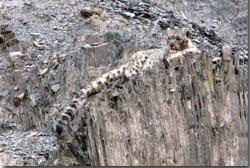 This is such an exciting project (a two week trek in February 2010 to search for wild snow leopards and their prey). The previous winter teams have all seen wild snow leopards ….amazing…you all know that this is a rare thing indeed, rarer than the proverbial hen’s teeth. check out the project info here. This would have to be one of the most amazing wildlife experiences ever…truly the chance of a lifetime!